HNTB President & CEO, Paul Yarossi, above, during the ARTBA Federal Issues Program. “Determining what right looks like” is a key tool for being an effective leader, transportation design and construction industry veteran Paul Yarossi told ARTBA’s 20th Annual Young Executive Development Program (YEDP) class. The president of HNTB Holdings, Ltd., addressed the group of 54 up-and-coming industry executives during the Federal Issues Program and Transportation Construction Coalition Fly, April 13-15, in Washington, D.C. Being credible. Keep asking if you are doing things right. 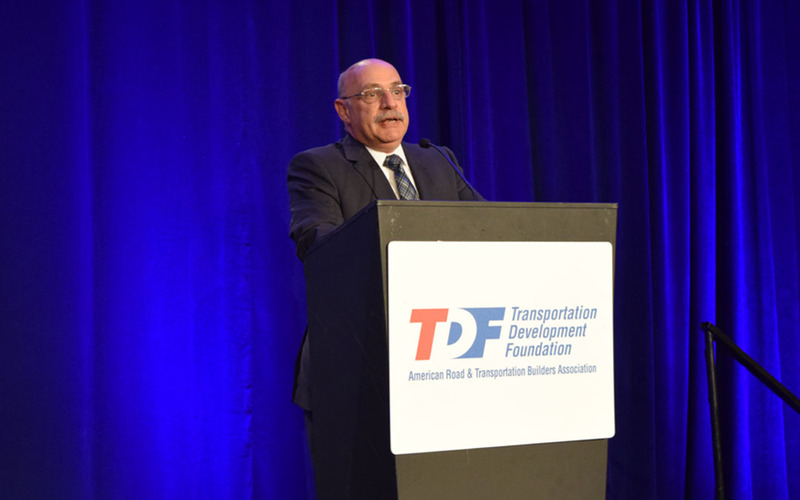 Yarossi, with 43 years of industry experience, was ARTBA chairman in 2012 and played a critical role in spurring Congress to pass the two-year, MAP-21 surface transportation investment law. He received the ARTBA Award, the association’s highest honor, the following year. More than 600 people from over 200 companies, state contractor groups and public agencies have graduated from the YEDP counting this year’s class.